This is an awesome salad! 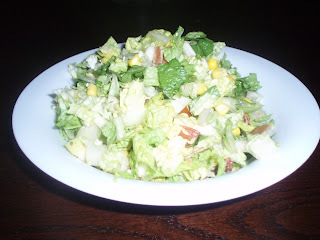 It is actually a replica of the chopped salad at the Cheesecake Factory, but the ingredients are simplistic, and it is easy to duplicate. All chopped fine, all tossed in a Balsamic Vinaigrette. Don't toss it if you do not intend to eat it all, because it will obviously wilt. Toss what you need, and save the rest!